Sonic Boomsprays , a Western Australian family owned and operated company, has released its new model the Ultra Sonic 13048TRS boom sprays. These boom sprays boast a 13,000 litre tank and triaxle suspension with front and rear steering. 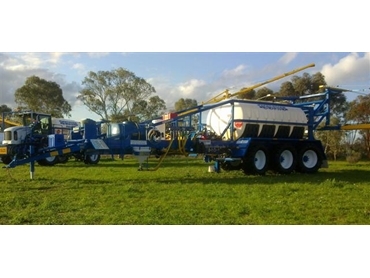 They are premium quality spraying machines and are ideal for use in the broad acre spraying industry. Ultra Sonic 13048TRS boom sprays are available in three standard widths, namely 48.5 metres, 45.5 metres and 36.5 metres. Sonic Boomsprays has a very sound foundation based on years of experience from farming, contract spraying and manufacturing. The trailer is of a longer type and can, therefore accommodate the main wing length. The Sonic is designed to have the A wing longer than the b wing. This ensures greater stability.